Our Aviation Community: You're a Pilot? I Love Ya', Man! 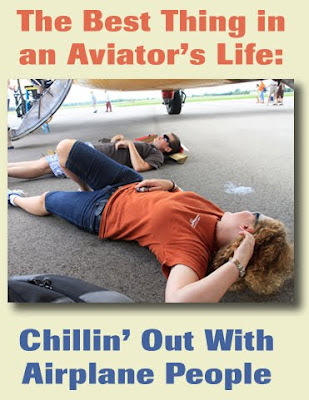 Many of us are still coming down off our EAA Airventure Oshkosh high, trying to blend back in to daily life without thinking about flying machines 24/7. We're washing the brat stains from our "Rock Your Wings!" t-shirts, trying to find the bottom of our overstuffed rollaboard bags, and trying not to focus on how many days there are left until Oshkosh 2011. According to census.gov, there are an estimated 309,891,332 of us here in the U.S. as of 8.03.2010. But while the FAA doesn't give real-time statistics, in Dec 31, 2009 there were 594,285 active airmen certificates held. Yes, there is some wiggle room in these numbers since a few months worth of babies were born, but without getting all "mathy" on me, that means pretty close to 0.19 percent of the population are licensed pilots. To pound this stat home, say you walk into a packed theatre that holds 1,000 people. You, as a licensed pilot, would have a tough time finding the one other licensed pilot in the room. Or, when the numbers get crunched a little more, we see that on a beach populated with 521 people, you'd be the one guy or gal with your pilot's license shoved in the back pocket of your board shorts or hidden in your bikini. From the moment I set foot in Kindred, North Dakota to hook up with Duggy's owners on 7/23, I began meeting "airplane people" that I really, really liked. The Odegaard family treated me like one of their own, their house was my house, their car my car. The next two days, I hung out with six previously total strangers at the Rock Falls DC-3 event who arrived there like me inside the happiest plane in the sky, and it was golden. Two memorable young people on board Duggy were Tanner, from Kindred, and Jessica from Minnesota. Both were Odegaard family friends and huge Duggy fans. It took only minutes after meeting these two seriously special young flyers to become old buddies. We chatted up each other for many hours over the next 48 hours, poked fun like we knew each other forever, and earned each other's mutual respect. It was truly a breath of fresh air to meet such wonderful young members of this aviation community, they are the future, and that future is very bright indeed. Rod Rakics and Mike Miley run MyTransponder.com, a website devoted to "making aviation more social." The pair likes to practice what they preach on the site too. As the highway 41 traffic whizzed by the Old Sears parking lot that was the temporary replacement for Camp Scholler, about eight new friends teleported themselves to the side of the motorhome to chow down and drink some crazy Wisconsin beer made from berries, brats and cheese. O.K., probably not cheese. Before the evening ended, this new pack of buddies – tethered together by our iPhones, iPads and Twitter – descended on the local Dairy Queen to forcibly remove large Blizzards from the premises. When this geek squad determined that the DQ had free wi-fi, it became our goal to collectively try to bring the network down with our fingers as they flittered and flamed across our virtual keyboards tweeting about ice cream and airplanes. Yes, we are very lucky to have each other, and with only the rarest of exceptions, pilots in this community are kind, helpful souls who would rip the shirt from their back if you were a fellow stick in dire need of a shirt. A few days at Oshkosh proved yet again that this big happy family can get along swimmingly, we can co-exist in our aviation world while the rest of the planet can't seem to keep from killing each other over the damnest things. Each day, I seem to be more proud of my pilot's license, and what it represents. It gives me the license to fly a machine high above the crust of this crazy planet, something than does not come easily or without risk. But that little FAA card with Orville and Wilbur's picture on it also gives me admission to a very elite club, a group of fellow aviators that share one common bond so strong nobody outside the group will ever understand. 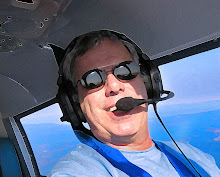 And the glue keeping the aviation community together in solidarity and AvGas-induced bliss is that...we fly!